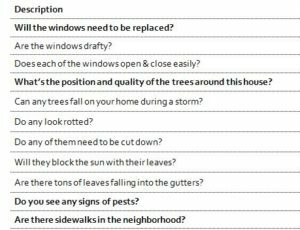 The “32 Questions You Must Ask Before Buying a New House” sheet is a free template that can help you consider important points for buying a home. Everyone has their reasons for wanting a new home. Whether it’s your first or your last house, this template raises the questions that help you determine if it’s the right property for you. You’ll receive a simple document that lists out important details when you’re considering a home, like if windows need replacing, signs of insects, the age of the home, and a lot of other things most people don’t consider when they’re blown away by the setup of a house. If you’re ready to get started, just read the guide below. To download your new template, just follow the link at the bottom of this page to get started. When you have your document open and ready to review a home, you will go through the list of items and continue to check them off your list. Start by printing the sheet. To print, click the “File” button, in the Home Ribbon, and select the “Print” option from the drop-down list. For example, let’s say you’ve examined all the windows in the home and found that only one had a small crack. You would mark the first item as done and write a short comment in the line to the right. You could use the line to specify which window required replacement and why. By the time you finish your list, you should have an all-inclusive review of the condition of your home. From there, you can decide the best course of action to take.